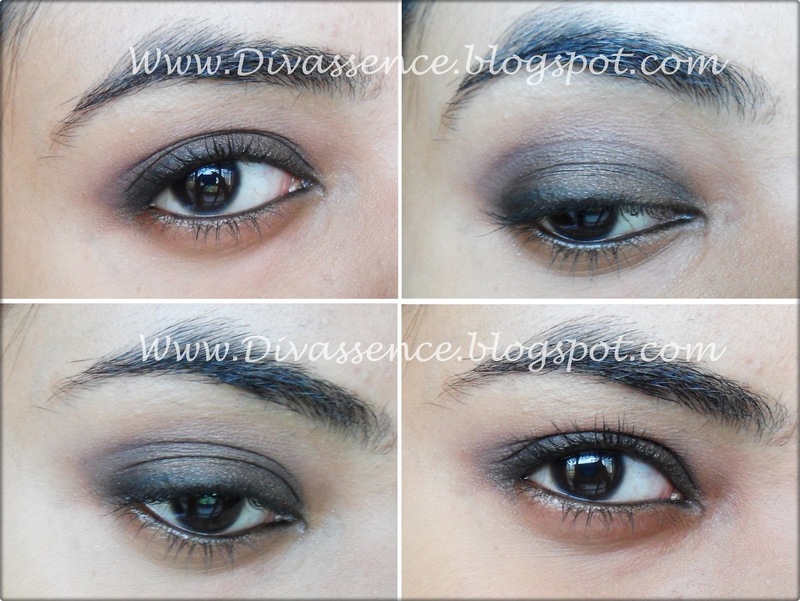 Simple Brown Smokey Eye makeup tutorial - Divassence! Since I wanted a strong base for this look, actually smokey eye makeup is all about strong firm base no matter what colors you use 😉 . I first applied and blended a shadow base only on the lid. Then with a flat shadow brush, I patted very little amount of a black gel liner (you can use a pencil, or a black shadow base, whichever you have) and applied it close to lashes, and gently patting + pulling it across the lid in order to feather it out. But with this, I didn’t make any specific shape, I just followed the shape of my eye. Then before letting the liner dry, I blended and put it to place with the help of a brown shadow. You can use any brown shadow you have, matte, pearl or shimmery. This doesn’t requires a lot of effort, all you have to do is flip the side of flat shadow brush you used previously, and just pack in the brown shadow all over the gel liner, and just following your socket line. Then I used a medium brown shade, and using a fluffy brush, just went to-and-fro on the outer edges of the brown shadow, i.e. blended the edges to make it soft. After that I took some compact powder to highlight my brow bone, this will also help clean up the edges of medium brown shadow. For a night time look, you can opt for a pearly gold shadow to highlight the brow bone. At last I used an angled brush to create a smudged liner look along the lashes. If you want you can draw a thin/thick line acc.to your need, but since I was wearing this out daytime I opted for a soft look, hence just used a black shadow along the lashes. Then I filled my waterline with black kohl pencil, and finished up with mascara. ← And Divassence turns One!! wow the result is amazing !! good job ! Really like this look Im going to give it a try for daytime! I HATE the colour brown..i never have liked a brown eyemakeup look before but im so liking this.u do everything so beautifully.I like how subtle you’ve made a smokey eye look.Great work upsi! Nice tutorial. helped a lot. hey can u post on eye makeup for natural look? I mean without playing much with colors, a decent makeup. Most of the time ppl need it ryt?